A recent New York Times article titled “Stop Googling. Lets Talk.” lays out a compelling case for greater intentionality in how and when we make use of our portable devices. How can we purposefully create environments where children learn to make decisions about these tools and use them (or NOT!) for the good of themselves and others? In schools and at home, how do we recommit ourselves to the priceless value of authentic human connection? More than anything, our children and students need to know who they are and who those around them are. Without self-knowledge and awareness of others no meaningful or lasting difference can be made in the world. Strike a balance: Planning comes naturally to me. I like a schedule and a sense of what is coming next. 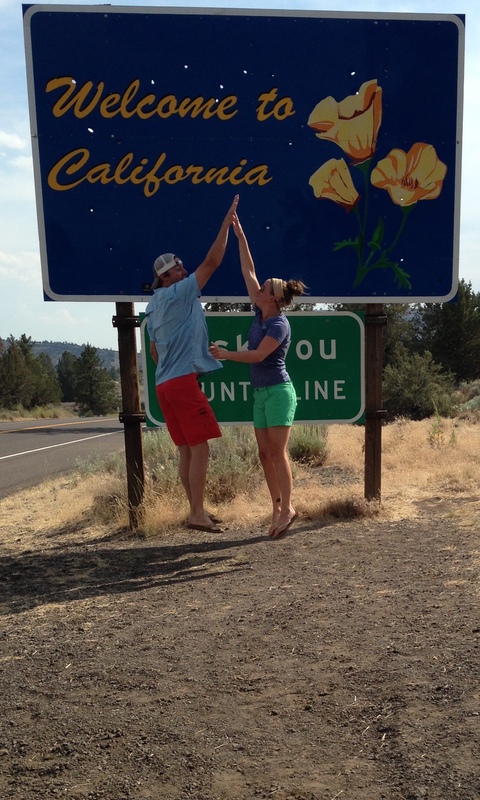 Some of my best memories (from this trip and beyond) are those that were a result of spontaneity. I’m learning to hold them both and value them equally. To allow my nature to create a plan…but to leave ample room to change that plan spontaneously. We had planned to visit at least 2 spots that, because we spent the bulk of our day exploring something else or because we were exhausted from being on the road, we ended up not visiting. Would they have been beautiful? Certainly. But allowing for a change of plan meant a gentler, healthier overall 11 days. Plans & spontaneity can coexist. 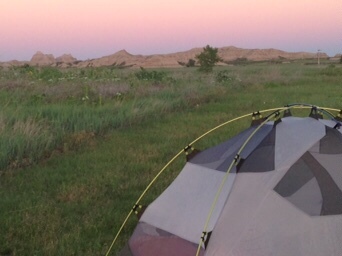 Turn around if necessary: On our first real day-of-adventure we awoke in Badlands National Park in South Dakota. We were up with the sun and had our campsite packed up…we were among the first in the visitors center, coffee in hand. We enjoyed a beautiful hike back through some of the formations to a spot overlooking the prairies below. Feeling energized by the physical exercise and the natural beauty surrounding us, we quickly packed up for another, longer hike through some prairie lands. Within a few tenths of a mile it was clear that the mosquitoes were mustering their forces and had some serious battle plans. After a half mile or so we turned around. We did something else. You don’t have to be a hero. Go get a beer instead. 🙂 But seriously…when all of the warning bells are going off: listen. Backtrack. Go a different way or stop and reset. 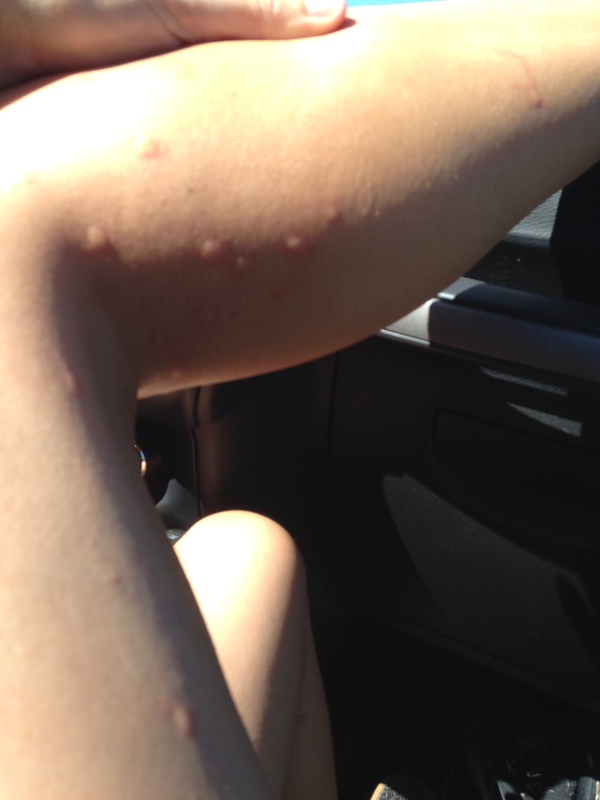 Life is too short to lose your leg to mosquito bites…or stubborn pride. Pick the right sunscreen: Seriously. Goopy, thick sunscreen is the worst driving around with the windows down, getting sweaty, and absorbing dust. Bad sunscreen gets in your eyes (and god forbid you wear contact lenses) and stings them like hundreds of tiny needles. In my humble opinion the good sunscreen is anything Neutrogena. Consider yourself warned and wisely advised. Eavesdrop on (and occasionally converse with) strangers: Turns out children say amazing things to their parents in National Parks. You’ll find that asking someone to take your photo will always result in a story. The friends of a woman who took our photo at the entrance to Grand Teton National Park photo bombed our picture after deciding we weren’t looking excited enough! 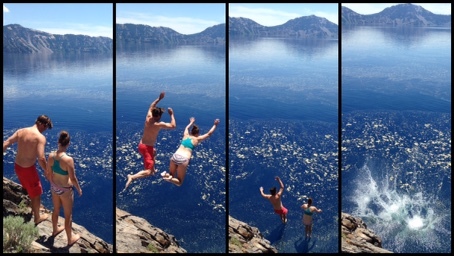 After offering to take a photo of two folks at Crater Lake National Park, they asked if they could return the favor and snapped some of the most amazing action shots of us jumping in to Crater Lake (the country’s deepest lake) together. I don’t know the name of the girl who took our pictures…but I’ll always remember her. Strangers aren’t always dangerous. Appreciate and savor it: There were moments on the trip that felt like all of the stars aligned and we couldn’t have orchestrated it more beautifully even if we’d been able to control/plan it. 80-85 degree weather and sunshine every day? Check. Arrive at Old Faithful in time to get a cocktail on the deck of the hotel and see the geyser go off on the first sip? Check. 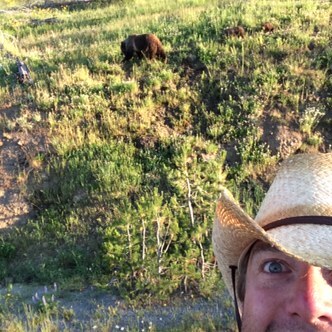 Drive into Yellowstone park and see a mama grizzly and her two cubs? Check. Find an equal quality but peacefully secluded swimming hole a few hundred yards from the really crowded swimming hole? Check. Snag one of the few remaining campsites? Check. There were plenty of times that things didn’t go perfectly….but why focus on those? Effortlessly timing it right is a beautiful thing…appreciate that joy, celebrate it when it happens and let THOSE memories prevail. Share the wealth: One of my favorite parts of chronicling our journey on a photo stream was getting to share it with friends and family instantly…and to read their comments and questions and feel like the circle of who was a part of our move was a little bit bigger, and a little more full of love and joy in our journey. Keep in mind that no photo or video will ever do justice to your experience (on the road or elsewise). That little uncapturable p iece will always be just yours. Your story. Your experience. Your memory. Wake up early for the sunrise: You will never regret it. There’s nothing like the impending New Year to send the web into a fierce storm of retrospectives and Top Ten (or any other number) lists reflecting on the highlights of 2014. So, I’m jumping on the bandwagon. Here are some (six, if you’re counting) of my favorite things worth noodling on as we hit the “refresh” button for another year. 2014: The Year in Ideas – An 8 minute recap of the most watched, most powerful, most moving TED talks of 2014. Prepare to have your curiosity piqued and your excitement ignited for the ideas ahead in 2015. NASA Emails Working Wrench to Space Station – Wait, what?! This is just too cool. 3-D printers are being used to manufacture tools to suit the need-of-the-minute for astronauts troubleshooting in space. Need a tool? No problem – have that to you in an e-jiffy. Another reason to think carefully and innovatively about the future we are preparing our children/students for. What Believing in the Possibilities can Do for Teaching & Learning – Meaningful, connected relationships and positive, authentic beliefs matter. Growth mindset. Growth mindset. Growth mindset. TED Talk: The Surprising Science of Happiness – Whoa….a person can be happy when they don’t get what they want? Equally happy? EVEN MORE HAPPY?! Amazing stuff about the power you have to define and actualize your own happiness. Women In Science Illustrations – An incredible look at one artist’s representation of key female figures in the history of science. Graphic design + inspiring women advancing the field of science = even more reasons to go forth into the new year ready to meet what comes. Why We Need to Slow Down – Pause. Read it. Go slower. So, here we are, approaching the season of holidays galore…and with that the hurried making and checking-off of lists, cleaning, shopping, attending, hosting, cooking, etc. etc. etc. 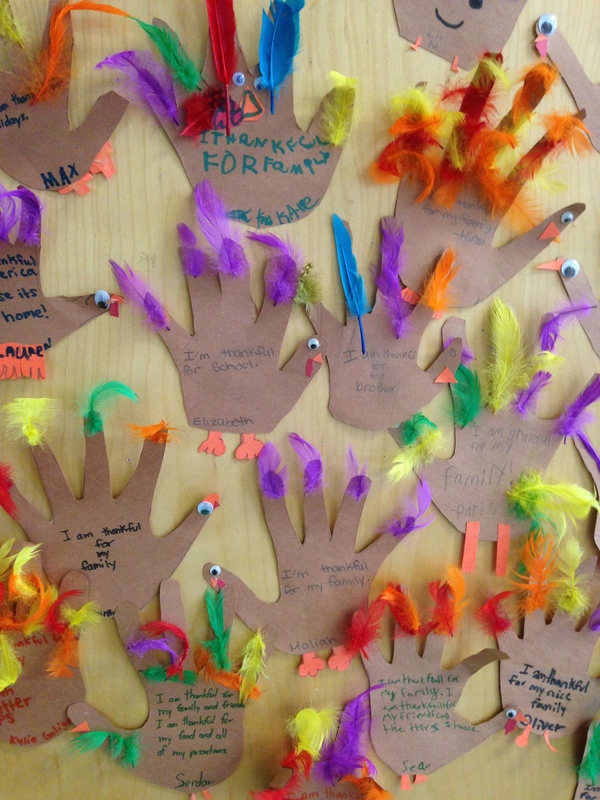 As we think about being thankful, as we think about giving and all of the ways it truly allows us to receive, as we think about what matters…may these two articles provoke some thought for teachers and for parents on behalf of keeping all our children anchored in what we truly value and taking time to slow down and be present. Are you raising nice kids? A Harvard psychologist gives 5 ways to raise them to be kind. – including the why, how, and concrete strategies to try. How two minutes of mindfulness can calm a class and boost attainment. – including links to relevant scientific research and resources for specific ways of using mindfulness practices with children. It was not THAT long ago that smart phones were a rare luxury found in the hands of high-powered entrepreneurs and financiers. Today they fall out of the half-zipped backpacks of young children and are left forgetfully behind by over-scheduled adults. We touch them within minutes of waking up, and turn screens off just moments before falling asleep. We fear missing out. We fear a great catastrophe if we aren’t instantly accessible….but didn’t nearly everyone who can read this post grow up in an era where if you left your house, you weren’t reachable until you returned? It begs the question: what are we teaching our children and students about meaningful living and learning? Two articles related to this question (links and excerpts shared below) recently caught my attention. As per usual, the most balanced perspectives on digital tools and media at all levels of education and in daily living are those that advocate for wisdom, moderation, and well-informed intentionality in the lives of both children and adults. If research shows that meaningful living and learning happen in the context of relationships, resilience, and reflection…how are we cultivating THOSE 3 Rs? It behooves us all to think carefully about what we are modeling for children about balance, presence, and self-care. Washington Post: Are You Really Here? Or Are You Skimming? This article by the Harvard Business Review is a powerful lesson for teachers, administrators, and any highly scheduled adult looking to model a life of balance for children. The article compares the common philosophy upheld by experienced chefs of mise-en-place (everything in its place) to beginning our work (whatever the work is) with focus and purpose. “What’s the first thing you do when you arrive at your desk? For many of us, checking email or listening to voice mail is practically automatic. In many ways, these are among the worst ways to start a day. Both activities hijack our focus and put us in a reactive mode, where other people’s priorities take center stage. They are the equivalent of entering a kitchen and looking for a spill to clean or a pot to scrub.